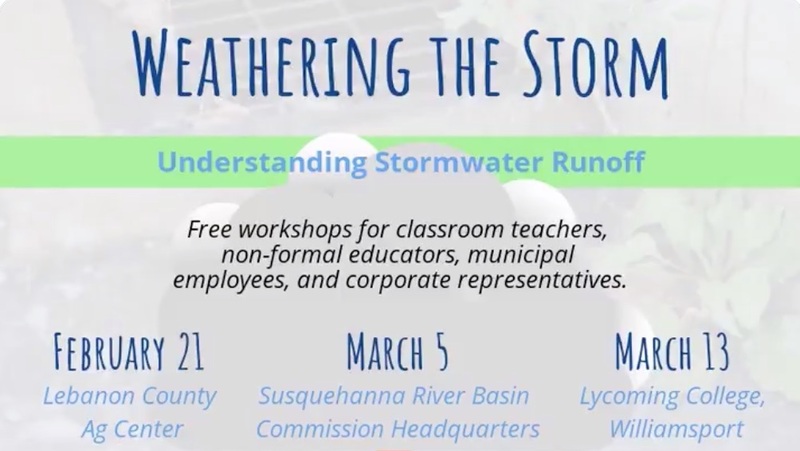 On February 6, the Department of Environmental Protection announced a series of Weathering The Storm, Understanding Stormwater Runoff Workshops with local partners in Lebanon, Harrisburg and Williamsport. These free workshops are for municipal employees, business representatives, classroom teachers and non-formal educators. Learn how to create Meaningful Watershed Educational Experiences (MWEEs) that provide students the knowledge and skills to protect and restore their local watershed by taking action to reduce stormwater runoff pollution. Workshop participants will gain a deep understanding of MWEEs as a vehicle for advancing environmental literacy and stormwater stewardship, while increasing standards- based student achievement. Through these learner-centered experiences, students investigate local environmental issues and experience informed civic engagement. -- February 21: Lebanon County Ag Center, 2120 Cornwall Road, Lebanon from 8:30 a.m. to 3:00 p.m. Click Here for more. -- March 5: Susquehanna River Basin Commission Headquarters, 4423 North Front Street in Harrisburg, from 9:00 a.m. to 3:00 p.m. Click Here for more. -- March 13: Jane Schultz Room 1st Floor of the Wertz Student Center at Lycoming College in Williamsport from 8:30 a.m. to 3:00 p.m.. Click Here for more. The Workshops cover: MWEE framework and lessons; DEP MWEE Stormwater Action Project; Funding sources for public schools and communities required to reduce stormwater runoff within the Chesapeake Bay Watershed; and Demonstration of stormwater best management practices at the Susquehanna River Basin Commission. MWEEs have the strongest impact when k-12 and nonformal, field-based educators collaborate. 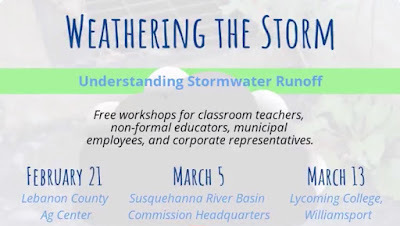 This workshop helps prepare non-formal educators to partner with classroom teachers on a stormwater project. All participants will take home a variety of resources including Penn State Extension's “Rain to Drain” curriculum, “An Educator's Guide to the Meaningful Watershed Educational Experience (MWEEs)” and “DEP's Guidelines for Maintaining Streams in Your Community” to address stormwater within their school district and community, including a proven project framework. Additional resources available through Penn State Extension, the Susquehanna River Basin Commission and the PA DEP MWEE Stormwater Action Project Grant Program will also be available. The Workshops are sponsored by the Department of Environmental Protection, Department of Conservation and Natural Resources, Penn State Extension, and the Susquehanna River Basin Commission. To register in advance for any of the Workshops contact Bert Myers at DEP by sending an email to: gimyers@pa.gov or calling 717-705-3767. Visit DEP’s Environmental Education webpage for more information on education programs. Click Here to sign up for DEP’s Teaching Green newsletter.